World Economic Forum’s reception area. New York, NY Interior designer Montroy Andersen DeMarco (MADGI), an affiliate of Montroy DeMarco Architecture (MDALLP), has completed the United States headquarters of the World Economic Forum, a Geneva, Switzerland-based non-profit organization with the mission of improving the state of the world. The project has received 82 LEED points, which allowed it to achieve LEED Platinum certification, the highest level of sustainability awarded by the U.S. Green Buildings Council. “The World Economic Forum engages business, political, and academic leaders as well as civil society through meetings and initiatives to shape global, regional, and industry agendas. Our new New York City office designed by Montroy Andersen DeMarco supports our mission and provides a comfortable work environment for our employees,” said the Forum’s head of finance and operations Stephan Ruiz. 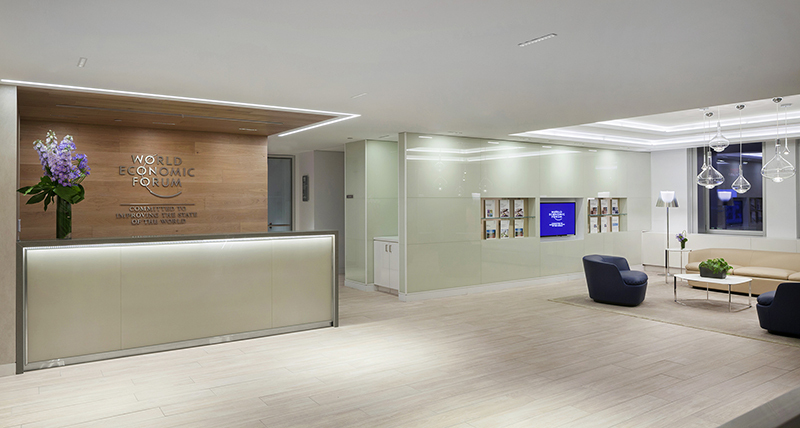 “World Economic Forum’s new offices occupy the entire 10th and 11th floors of 350 Madison Ave. Our team designed the space to accommodate both the organization’s 150 New York-based employees as well as facilities that hold meetings for up to 160 participants,” said MADGI principal, Steven Andersen. The design team wanted to create a high-end, more sophisticated reception area on the 11th floor, where guests, speakers, and leaders are greeted. “The overall look and feel for the entire space is light, warm, and contemporary, with an understated European aesthetic that is a nod to the visual language of the Geneva headquarters,” said MADGI designer Mariana Panova. 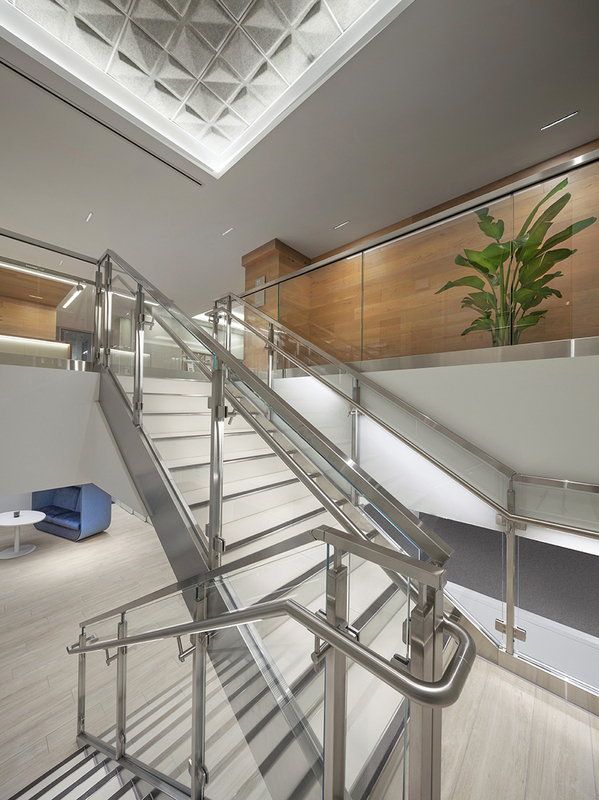 In the 1,300 s/f reception area, the design team redesigned and highlighted an existing staircase and created a seating area. MADGI specified Bendheim glass cladding on the entire back wall of the architectural staircase. “The 11th floor is functionally split on two sides of the reception lobby. The building layout allowed us to separate one side of the floor as public and meeting spaces, and the other as an administrative work area,” said MADGI project manager, Elizabeth Zagarello, AIA. The seven conference rooms all have audio-visual capabilities and video-conferencing equipment, and range from 150 to 500 s/f. The plenary space is 950 s/f. After descending the stairs, one finds an employee entrance foyer and team meeting area. The rest of the floor plan comprises executive offices and an open plan office section. • General contractor: J.T. Magen & Company, Inc.
• Project manager: Craven Corp.